This week National Masters Ian Harris and Josh Colas, as well as seasoned tournament veterans Mikhail Koganov and Garrett Browning, competed in the our first quad. Despite being third seeded, Koganov got off to a great start, beating Harris and drawing Colas. His last round victory over Browning clinched a narrow first place victory. Meanwhile, CCFC Director Melvin Patrick, Guy Colas, Al Pinto and the younger Koganov, Leo competed in the second quad. Patrick put in a commanding performance, winning with a perfect 3/3 score. 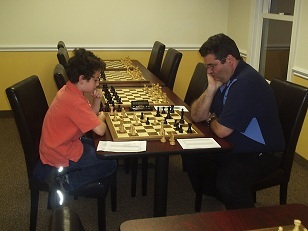 Pinto also had a strong result, scoring a 700 point upset and picking up 100 rating points!